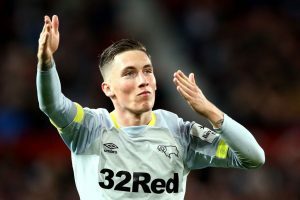 Derby County Exclude Striker From Preseason Game Amidst Leeds United Interest: Should Bielsa Move In? Derby County have excluded Matej Vydra from the last three preseason games. It’s believed that the striker will be slowly pushed into the first team as he is still recovering from a groin injury. The Rams have played two friendlies so far and last season’s Championship top scorer has missed both of those games. The future of Vydra at Pride Park is up in smoke as the Rams owner had indicated that they will need to cut down on their losses and Vydra happens to be the most valuable asset they have currently in their squad. The Czech Republican has been linked with quite a few Championship sides including Leeds United who are in desperate need of a goalscorer. The Whites are short on goal scoring options and with less than a month to go before the end of this transfer window, they are still in search of a striker. There have been speculations that Frank Lampard wants to keep hold of the player but one cannot say anything for sure as long as the transfer window is open. We have often seen clubs masquerade behind the injuries when a certain player’s future is uncertain. One cannot forget how Philippe Coutinho of Liverpool missed a few initial games of the last season due to a back problem when there were numerous speculations about his move to Barcelona. However, straight away at the international break, he was fit enough to represent Brazil. The 26-year-old striker managed 21 goals in the Championship which made him last season’s top scorer. The Rams came close to qualifying to the Premier League, however, they lost the playoff semifinal. On the other hand, Leeds United were far from challenging for the top six spot as they finished in the 13th spot. Even if Vydra decides to leave, it will be a bad decision on his part as the Rams are more likely to qualify for the Premier League. Read More: Leeds United Fail To Land 26 Y/O Uruguayan Defender: 3 Replacements Including This PL Ace! The Peacocks seems to be waging a losing battle here as the likes of West Bromwich Albion will be ahead in the race to sign him. Until and unless the owners decide to splash the cash in upward of £1om mark for the striker, the Whites should probably look at other viable options instead of wasting their time behind the last season’s top scorer. Celtic Leading Chase To Land £20m Rated Liverpool Star: Good Fit For Rodgers? Leicester City Seals £12.5m Move For This Liverpool Defensive Ace: The Right Choice For The Foxes? Derby County Seal The Deal For 27 Y/O Brentford Ace Amidst Leeds United Interest: Big Blow For Bielsa? Derby County Plotting Move For 29 Y/O Championship Forward: Do They Really Need Him? Derby County Given Third Best Odds To Sign Crystal Palace Winger: Could He Be Lampard’s First Signing?